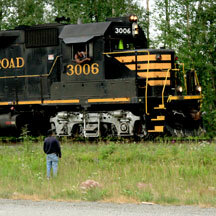 Alaska Railroads Engine 3006, a workhorse with hard working staff. Settin’ astride the tracks in Palmer, Alaska is the ol’ Engine 3006. In Alaska, as in so much of rural America, the railroad is a powerful presence. Throughout this journey trains have rattled not far off, whistled so close, made themselves known to any who would listen: from Charleston to Chattanooga, from Kansas City to Rapid City, from Calgary to Anchorage the railroad clickety-clacks its rhythm, toots its music, howls its whistle through day and night. As is true of the lower 48 states, trains of Alaska move goods and people, but in Alaska there is an extra beauty: the luxury passenger trains that bring Alaska to you: Denali Star, Coastal Classic, Glacier Discovery, Aurora Winter Train, Hurricane Turn. Driving along the George Parks Highway, Alaska Route 3—one parallels the route of the Denali Star, Alaska Railroad’s flagship train: Anchorage to Fairbanks and back, bisecting the state with fantastic double-deck domed railroad travel cars. Route 3 from Denali National Park winds through mountain valleys where one finds it quite spectacular to watch the domed cars glide by, providing their passengers a view of the the wild country like no other. Imagine the sweet luxury of the dining car and attentive staff as the train rolls you through the wildest country you will ever see, slowing for wildlife as much as for local stations in little towns that dot the map. At Palmer, I met Ian Frazier, Conductor, and Davy Registe, Engineer, a’settin’ in Engine 3006 on the tracks doing what they do: delivering supplies to maintenance crews who replace rails and ties, repair switches and signals and keep the railroad running smoothly throughout Alaska. Waiting on the call, they were ready to move to a trouble spot, responding on a moment’s notice to a dispatcher’s directions. There is magic in trains that draws me like a moth to a light bulb. Behemoth monster trains wield unimaginable power moving tons and tons of cars along miles and miles of track, all driven by men like Ian and Davy whose expertise, physical strength, skill and courage make railroads come alive. When I saw the train setting there by the side of the road I couldn’t resist running up, “helloing” up to the engineer. Taking photos of the huge engine staring up at what seemed to be at least two stories higher than me, I ran up front, to dead center between the rails as if the engine were bearing down on me along cold steel tracks, lights ablaze, engine “cooking” with a powerful diesel purr. What a kick! Those guys came out on the platform and we had a quick chat as their radios quietly spoke the railroad language. Suddenly their eyes lit up and they waved me off— “Gotta Go… we got the call… good luck on your journey, so long and goodbye.“ They were gone. Never had time to ask so many questions. Never had time to ask, “How ‘bout a ride?” I suppose there are regulations but wouldn’t that be a kick, up there in the engine cabin watching the meters and gauges as we roar down the track jumping over moose and bears, elk and caribou. Just the dream of a boy, now a man with the heart of a boy, looking for mischief; a lover of life. Someone’s making love I know. What amazing country. You really captured the idea of “scale” perfectly; the increase in all things being proportionate to the things around them. Big country, big landscapes, big history, big men, big machines and big magic. It’s wonderful to share your unique perspective and ideas. I’m surprised you didn’t have a story from Great Grandpa “Pop” Smith about his railroad days. Stay safe and warm (both of you) and living in your blessed experience of this great big world.